In February 2017 this project started with the council removing all overgrown planting from the bed and preparing the way for us to plant our bug friendly plants. After a lot of research into finding suitable plants to grow on a North facing site, planting commenced mid-March. Watch a video of the event here. 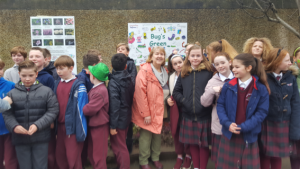 This led to us looking to further the bug theme and we contacted the Greystones Men’s Shed to see if they would like to be involved. 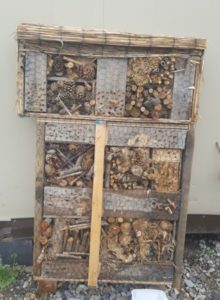 They were only too delighted and built us 3 sizable Bug Hotels. Next stage of the project involved coming up with a name for the park and the design of the poster. 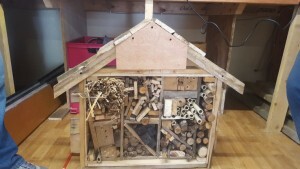 This was done by the TY students at Temple Carrig and the 5th class of St Kevins School under Mr Flynns supervision. 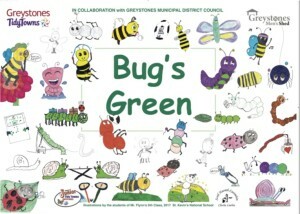 The children drew all the bugs for the poster which was then created by Lynne Reece Loftus. 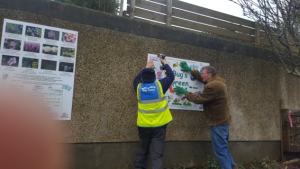 A sign describing the plants, their flowering period and benefits to wildlife was also created and placed at the site. 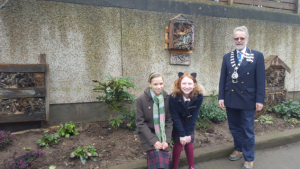 Finally almost 1 year later the park was officially unveiled by Cathaoirleach Derek Mitchell with the children from St Kevins School in attendance.